"I do open paintings. I like lightness, airiness, and the way color pulsates. The presence of the painting is all that's important." In the latter half of the 1950s, Washington D.C. saw a flourishing of abstract art that emphasized the form-making capabilities of pure color. Known as The Washington Color School, the loosely affiliated group of abstract painters knew each other through various teaching experiences. The moniker has an uncertain origin but likely originated with the title of a 1965 exhibition at the Washington Gallery of Modern Art, "Washington Color Painters," curated by Gerald Nordland. The show exhibited the works of Kenneth Noland, Paul Reed, Morris Louis, Howard Mehring, Thomas Downing, and Gene Davis. Additionally, Leon Berkowitz and Sam Gilliam along with V.V. Rankine, Alma Thomas, Hilda Thorpe and Anne Truitt were also associated with The School. Using innovative techniques that expanded on Abstract Expressionist experiments with color and paint application, the Washington Color School created deceptively simple compositions that evoked dynamism and tension. Championed by the art critic Clement Greenberg as part of the larger trend of Post-Painterly Abstraction, the work of the group was seen as the culmination of modernist painting, with its emphasis on the two-dimensional surface of the picture plane and its lack of reference to any subject matter. The Washington Color School embraced the larger trend of Color Field painting, and some of its practitioners experimented with Hard Edge painting as well. In many ways, these D.C. artists anticipated the style of Minimalism and then evolved alongside it, and the teaching legacy of the Washington Color School left its mark on a generation of artists in Washington. While many saw these experiments as a way of moving out of and beyond Abstract Expressionism, others saw them as a formal dead end and divorced from the tumultuous atmosphere of the 1960s. The Washington Color School used color, and not drawing, to create and delineate simple geometric forms. They often spoke of wanting to put pure color on the canvas to create an immediate, all at once, visual experience for the viewer. This optical experience became more important than conveying subject matter. Many of the artists associated with the Washington Color School used a soak stain technique whereby thinned acrylic paint saturates the raw canvas. Instead of sitting on top of the canvas, the color becomes one with the canvas. Without the physical layers of paint, this technique emphasizes the two-dimensional nature of the picture plane, which according to Clement Greenberg was one of the main goals of modernist painting. As part of the larger trend of Color Field painting, The Washington Color School shunned the histrionic personas that had grown up around the Abstract Expressionist artists. Instead, the execution of their paintings were more anonymous, without the gestural presence of the artist. In downplaying the presence of the artist, the viewer's experience comes more to the fore. This switch in emphasis from the artist to the viewer was in line with other artistic experiments of the 1960s, including Happenings and Minimalism. The Washington Color School evolved from the Abstract Expressionist experiments with color and all-over composition. Clyfford Still, Barnett Newman, and Mark Rothko, sometimes referred to as Color Field painters, created bold compositions with large expanses of color. Clyfford Still created canvases with jagged areas of impasto color applied with a palette knife, and Newman punctuated large fields of color with vertical lines he called "zips". Rothko's vertically formatted canvases juxtapose rectangular areas of color that seem to float on the canvas. While the Washington Color School developed the techniques used by the Abstract Expressionists and adopted the new technique of staining, the artists tended to eschew the emotional and dramatic rhetoric used by the older generation. Aptly named, this work marks the beginning of Noland's Washington Color School style. Its basic geometric form explores the lively effects of contrasting and complementary colors, depicted in concentric circles, centered on a square canvas. Noland eschewed representation and pictorial depth in favor of focusing on the relationships of the colors. Noland compared his painting to music, saying, "painting without subject matter as music without words." The slight irregularity of the circles and the outer ragged halo of black paint give the work a kind of spontaneous energy, while the circular form draws the viewer's eye back toward the hypnotic center. Beginning exemplifies the artist's desire to create what he called "one shot" compositions. Noland's technique of staining the canvas meant that his paintings were extremely difficult to revise; what he put on the canvas had to stand as it was without second-guessing. Noland's "one shot" painting sought to overcome, in his estimation, the overworked compositions of the Abstract Expressionists. The Abstract Expressionists claimed that spontaneity was a cornerstone of their processes, but often their canvases were carefully built up over a period of time, sometimes years. Noland felt his paintings were truly spontaneous. As Greenberg wrote of Noland's circles, "His color counts by its clarity and its energy; it is not there neutrally, to be carried by the design and drawing; it does the carrying itself." The concentric circle on a square canvas became an iconic feature of Noland's work. In later works like Birth (1961), he reduced the number of colors, eliminated the penumbra effect, and regularized the concentric circles with hard edges, evolving his reductive approach. This large canvas exemplifies Louis's Veil (1958-1960) series of paintings, each depicting a similar shape, rendered in translucent 'veils' or layers of magna paint diluted with turpentine. Rather than emphasizing a geometric shape like Noland, Louis creates a more organic form, not nested, but enfolded, while exploring color and transparency. As art historian Karen Wilkin explains, Louis and other Color Field painters believed "that a painting, no matter how apparently restrained, could address the viewer's whole being - emotions, intellect, and all - through the eye, just as music did through the ear." Creating works like Faces in a very small studio, Louis began by stapling the 20-foot canvas to the wall, then pouring and manipulating streams of paint down the surface. Rather than the artist's brushstroke, the fluidity of the material, drawn by gravity to flow down the pictorial surface, is emphasized. The soak stain approach resulted in the colors melding with the weave of the raw canvas to create a diaphanous, layered effect. Through a veil of darker surface color, remnants of vibrant orange and green create a sense of movement. Relinquishing artistic control over the unpredictable results, Louis let the medium take on its own organic process to create the final result, as the paint itself became the subject. With this emphasis on the paint's own properties, Louis subverts the presence of the artist seen on the canvas, eschewing the unique gesture associated with Abstract Expressionists like Jackson Pollock and Willem de Kooning. Of the Veil series, Greenberg wrote, "The effect conveys a sense not only of color as somehow disembodied, and therefore more purely optical, but also of color as a thing that opens and expands the picture plane," and the art critic Michael Fried wrote, "the surfaces themselves...[spread]... with tremendous authority across the veil configurations as if in compliance with impersonal forces." These forces were to find analogous feelings within the viewer. This minimal and static object generates a dynamic energy that belies its simplicity. This large vertical sculpture, including the base, is divided asymmetrically into two shades of red, cleanly delineated from one another. As a result, the asymmetricality creates a kind of optical movement, with the dividing line both receding and projecting depending on one's perspective, and the two reds vie for foreground and background positions. Truit said, "Painted into color, this wooden structure is rendered virtually immaterial. The color is thus set free into space." Trained as a psychologist, she felt color had a psychological vibration, which could be clarified in an artwork, becoming an event, felt as a visual sensation. Truitt, more than her colleagues in Washington D.C., felt more emotional resonances with the Abstract Expressionists' goals. Residing in Washington, D.C., Truitt's artistic breakthrough in the early 1960s was influenced by the work of Barnett Newman, particularly by his subtle color modulations in the blue double paneled work, Onement VI (1953). As she said of the gallery encounter with Newman's work, "I looked at them, and from that point on I was home free. I had never realized you could do it in art. Have enough space. Enough color." While her work largely anticipated Minimalist sculpture of the later 1960s, she is more often than not, associated with the Minimalists. She herself insisted, however, "I have never allowed myself, in my own hearing, to be called a minimalist. Because minimal art is characterized by nonreferentiality. And that's not what I am characterized by. [My work] is totally referential. I've struggled all my life to get maximum meaning in the simplest possible form." This square canvas, symmetrically divided into concentric squares and employing a color palette of speckled blue, orange, and violet, displays Mehring's interest in the surface of color. The basic geometric form of the square becomes, by repetition and variations in size, a complex arrangement of interlocking shapes that draws the viewer's eye to the center. The use of blue in the center of the composition creates dynamic movement, as the adjacent areas, broken up by purples and oranges, have a zigzag effect. Unlike most of the Washington Color School artists, Mehring preferred to use thick pigments, creating a weight of luminosity. Each inch of the canvas becomes its own field of color, illuminated by specks of varying hues. As a result, while his work eschews the illusion of pictorial depth, the flat image takes on a dense but luminous materiality that sets his work apart from his Washington colleagues. 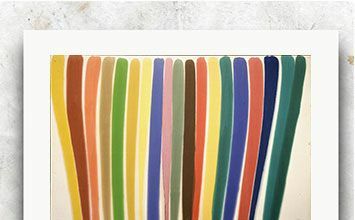 This painting, with its hard-edged stripes of equal width in different colors and shades, exemplifies Davis's emphasis on what he called the "color interval," the rhythmic effect created by the irregular appearance of color. Here yellow, red, green, and pink stripes pop vibrantly among black and grey stripes. Though the hard edge and uniform size of the stripes creates an orderly, almost calculated effect, the unpredictability of color creates the visual equivalent of jazz improvisation. He creates a complex schema of simplified forms to invite extended viewing and convey an unpredictable beat of spontaneity and play. Considered a leader in the Washington Color School, Davis emphasized what the art critic Barbara Rose called the "primacy of color." Davis was also a relentless experimenter. He subsequently explored a variety of formats, including video, neon, collages, modular compositions, as well as what he called micropaintings, an inch square, and public installations like his Franklin's Footpath (1972), a stripe painting filling the street in front of the Philadelphia Museum of Art. His work brought a playful intensity to the abstract forms of color field painting. As art critic Paul Richards wrote, "[O]n the lintel of his doorway he would inscribe one word ...'Whim.'" In the 1960s, Noland led the way as the Washington Color School moved toward a hard edge approach to their compositions. Having explored the concentric circle in hard-edged images like Birth (1961), he began to explore the chevron's V-shape, its straight lines of color outlined by thin lines of the neutral color of the canvas. The hard-edged, geometric form divides the canvas itself into triangles, two in neutral color on either side of the chevron's inverted triangular shape. Noland explored the relationships of contrasting and complementary colors when adjacent to one another while, at the same time, exploiting a nested shape. As the apex of the chevron intersects with the lower edge of the canvas, a sense of energetic tension is created. The work itself becomes what Noland called a "color structure," where color determines the outer edge of the composition. Noland's chevrons draw attention to the tension between flatness and depth, foreground and background. Reed titled this radically shaped canvas for a sea in Turkey. Trapezoids of various shapes in hues of red, orange, yellow, and brown surround a blue center, shaped almost like a key hole. Painted with matte and fluorescent pigment, the shapes create a sense of movement that lifts the overall shape off the wall, creating a dynamic, three-dimensional effect. Reed's reference to Turkey, suggests that we are looking through an Islamic arch, abstracted to the geometric shape of the center blue, which was meant to reference a body of water. However, in essence, the abstract shape becomes an object without reference that seems to inhabit space, receding and advancing as it effects the viewer's perception. The work both exemplifies the 1960s hard-edged style for which the Washington Color School became known and emphasizes the sculptural possibilities of painting. With this innovative work, Gilliam stained then squeezed and folded a large sheet of canvas and hung it in draping folds. In doing so, he freed the color field from its frame. The work takes on a sculptural materiality, both organic in its folds and geometric in its four triangular points attached to the wall. Gilliam's intent was to make color move, taking on an intense physicality. Dubbed "the father of the draped canvas," Gilliam began using unsupported canvas in 1965 and is credited with inventing the technique, inspired by watching laundry being hung on a clothesline. Deeply influenced by the jazz music of artists like John Coltrane, Gilliam expressed his artistic intent as to "just work and let things go," and he felt a painting should exist in real space, not separated from it by a frame. In the later 1970s, Gilliam fell out of the limelight, in part because as an African American artist, his abstract paintings did not speak directly to the plight of black Americans during the civil rights movements, and it is only since the first decade of the 21st century that his work is being reevaluated. A crackled and interlocking field of blue shapes on white canvas exemplifies Thomas's mosaic approach to creating an abstraction of luminous color. While avoiding any illusion of depth, the surface is energetic with darker and lighter intensities of blue, outlined and lit up by thin outlines of white. In the flat pictorial plane, the varying shapes evoke both a finely fractured piece of colored glass and a fractal, where an organic shape dissolves into similar shapes on an ever-smaller scale. As a result, the field conveys a sense of infinity, which led art critic Ken Johnson to call her "an incandescent pioneer." Thomas, an African American woman, turned to painting full time only in her sixties, after she had retired from teaching. Her earliest works, like Red Abstraction (1959), were Abstract Expressionist in style, but she soon became an energetic presence in the Washington Color School, evolving her own unique idiom of jewel-like colors and a kind of Byzantine mosaic effect. Though many of her works were inspired by what she called her "impressions of nature" and in the 1970s included her interest in space travel, her approach was profoundly abstract. Alma Thomas's work has garnered more recent interest, as Sky Light and two more of her paintings were displayed at the White House during President Barack Obama's administration.